There are eight vendors serving food and drink at Gotham West Market, including Infatuation favorite The Cannibal, reputable Brooklyn sandwich shop Court Street Grocers, and El Colmado, a Spanish tapas bar run by the dude from Tertulia. But the Ivan Ramen Slurp Shop is the one that's really got people fired up. This is the first-ever permanent NYC restaurant from international ramen icon Ivan Orkin, and if you find yourself wondering who that is and why he doesn't sound like a Japanese person, allow us to fill you in on that too. Ivan Orkin is a white Jewish man who grew up in Long Island, majored in Japanese at the University of Colorado, graduated from the Culinary Institute of America, and ultimately opened up a ramen shop...in Tokyo. And not only did his ramen succeed in Japan, it has become one of the most critically acclaimed and popular shops in the country. As you can probably imagine, that's quite the feat for a foreigner, and Ivan's legend has been steadily growing since he got in the game in 2007. Aside from a few pop ups here and there, ramen fans in New York were relegated to reading about his stuff in places like Ramen Magazine, and yes that's apparently a thing that really exists. But now Ivan is finally here with a permanent Ivan Ramen location. 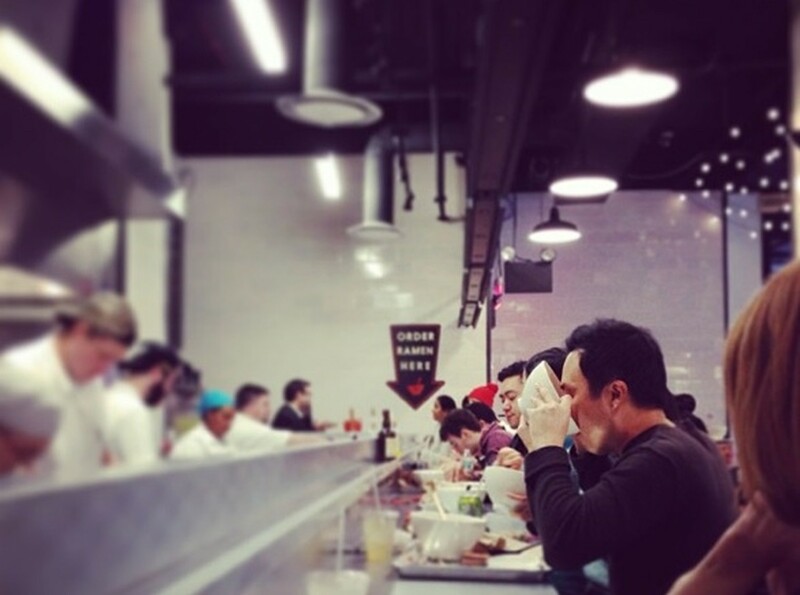 Like most of the other vendors in the Gotham West Market, Ivan Ramen Slurp Shop is cafeteria-style eating. You walk up to a counter, order your food, find a seat, and wait for your name to be called. Then what gets delivered to you is a bowl (or two) of seriously excellent ramen that we've decided we could eat every single day. The well-balanced chicken-based broth and the excellent rye noodles add up to an incredible soup that isn't nearly as heavy or nap-inducing as something like what you find at Ippudo. We also like this set-up, which is a piece of cake compared to the long waits at some of the other popular ramen spots around town. Here's to hoping that the 11th Avenue location make for manageable crowds. Ivan is also opening a flagship restaurant on the lower east side soon, so consider the Slurp Shop an appetizer to the forthcoming main attraction. Fire up your chopsticks. There are two things that make Ivan's ramen unique and delicious. First of all, he takes a double soup approach, which is popular in Japan, but not so much in the US. They make two separate broths, one from chicken stock and the other from dashi stock. The broths are then combined, giving the soup deep flavor, but also keeping it nice and light. Then you've got Ivan's toasted rye noodles, which are his own recipe. The noodle itself is part udon, part bread, part rye and they've got a slightly darker complexion than most ramen noodles. They're chewy and excellent. The shio ramen is essentially a basic salt ramen, with soft pork belly and an egg if you so desire. If you like it simple and salty, this bowl is for you. This is about as classic a bowl of ramen as you'll see at the Slurp Shop, and it was among our favorites for sure. You purists out there should be ordering this. The broth is delicious and subtle, and when you throw an egg in the mix, becomes pretty much perfect. Vegetarians, you should be paying attention. This is by far the best attempt at vegetarian ramen we've ever had, even to the point where we'd happily order it instead of the meat options. Instead of chicken stock, this is a soy sauce and vegetable based soup, with mushrooms and rye noodles. You should add in some additional fixins like roasted tomatoes too, but even without them, this is one of the most flavorful vegetable soups we've ever had. Talk about a rich bowl of noodles, D-A-M-N. This is my personal favorite item on the menu, but you better be a fan of thick broth before you decide to go there. Instead of a soup, this one is more like a carbonara pasta dish. It's heavy, it's garlicky, and it's delicious. Just make sure you have gum on you for after dinner, or maybe a different head. Rice bowls are a big part of the Ivan Ramen repertoire, and we were all about the Hebrew Japaneseness of this one. Smoked white fish and salmon roe sit atop rice with cucumber and scallions. Barney Greengrass would be proud. Scallions, cucumbers and pickled cucumbers in a shiso vinaigrette. Order them if you need some greens, but don't feel like you're missing something if you don't.